Advanced LIGO detects gravitational waves! The first observing run (O1) of Advanced LIGO was scheduled to start 9 am GMT (10 am BST), 14 September 2015. Both gravitational-wave detectors were running fine, but there were few a extra things the calibration team wanted to do and not all the automated analysis had been set up, so it was decided to postpone the start of the run until 18 September. No-one told the Universe. At 9:50 am, 14 September there was an event. To those of us in the Collaboration, it is known as The Event. The Event’s signal as measured by LIGO Hanford and LIGO Livingston. The shown signal has been filtered to make it more presentable. The Hanford signal is inverted because of the relative orientations of the two interferometers. You can clearly see that both observatories see that same signal, and even without fancy analysis, that there are definitely some wibbles there! Part of Fig. 1 from the Discovery Paper. The detectors were taking data and the coherent WaveBurst (cWB) detection pipeline was set up analysing this. It finds triggers in near real time, and so about 3 minutes after the gravitational wave reached Earth, cWB found it. I remember seeing the first few emails… and ignoring them—I was busy trying to finalise details for our default parameter-estimation runs for the start of O1. However, the emails kept on coming. And coming. Something exciting was happening. The detector scientists at the sites swung in to action and made sure that the instruments would run undisturbed so we could get lots of data about their behaviour; meanwhile, the remaining data analysis codes were set running with ruthless efficiency. The cWB algorithm doesn’t search for a particular type of signal, instead it looks for the same thing in both detectors—it’s what we call a burst search. Burst searches could find supernova explosions, black hole mergers, or something unexpected (so long as the signal is short). Looking at the data, we saw that the frequency increased with time, there was the characteristic chirp of a binary black hole merger! This meant that the searches that specifically look for the coalescence of binaries (black hole or neutron stars) should find it too, if the signal was from a binary black hole. It also meant that we could analyse the data to measure the parameters. A time–frequency plot that shows The Event’s signal power in the detectors. You can see the signal increase in frequency as time goes on: the characteristic chirp of a binary merger! The fact that you can spot the signal by eye shows how loud it is. Part of Fig. 1 from the Discovery Paper. The signal was quite short, so it was quick for us to run parameter estimation on it—this makes a welcome change as runs on long, binary neutron-star signals can take months. We actually had the first runs done before all the detection pipelines had finished running. We kept the results secret: the detection people didn’t want to know the results before they looked at their own results (it reminded me of the episode of Whatever Happened to the Likely Lads where they try to avoid hearing the results of the football until they can watch the match). The results from each of the detection pipelines came in [bonus note]. There were the other burst searches: LALInferenceBurst found strong evidence for a signal, and BayesWave classified it clearly as a signal, not noise or a glitch; then the binary searches: both GstLAL and PyCBC found the signal (the same signal) at high significance. 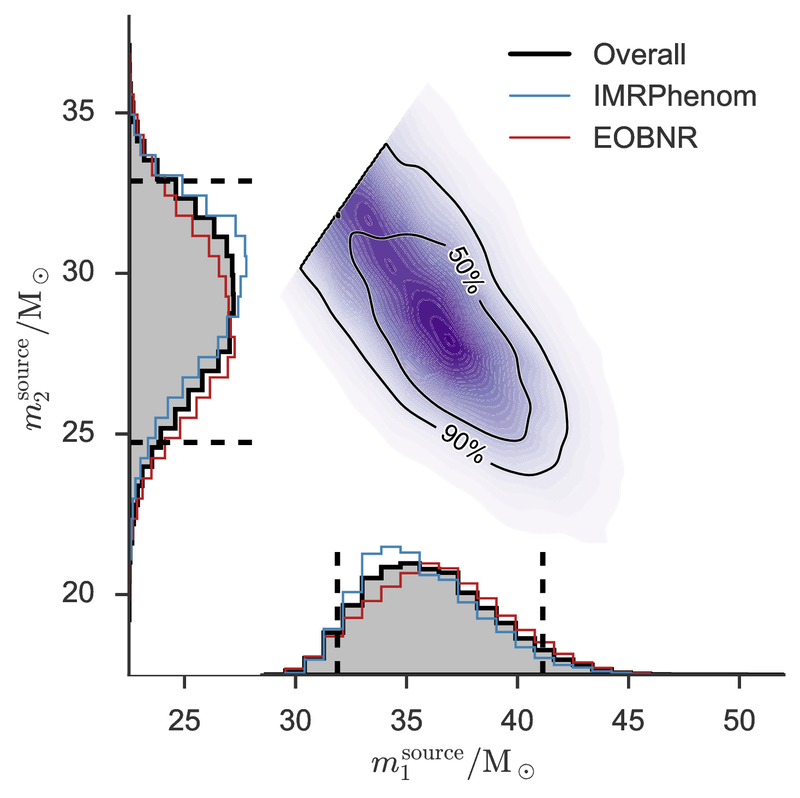 The parameter-estimation results were beautiful—we had seen the merger of two black holes! I still remember the exact moment this hit me. I was giving a public talk on black holes. It was a talk similar to ones I have given many times before. I start with introducing general relativity and the curving of spacetime, then I talk about the idea of a black hole. Next I move on to evidence for astrophysical black holes, and I showed the video zooming into the centre of the Milky Way, ending with the stars orbiting around Sagittarius A*, the massive black hole in the centre of our galaxy (shown below). I said that the motion of the stars was our best evidence for the existence of black holes, then I realised that this was no longer the case. Now, we have a whole new insight into the properties of black holes. Having caught a gravitational wave, what do you do with it? It turns out that there’s rather a lot of science you can do. The last few months have been exhausting. I think we’ve done a good job as a Collaboration of assembling all the results we wanted to go with the detection—especially since lots of things were being done for the first time! I’m sure we’ll update our analysis with better techniques and find new ways of using the data, but for now I hope everyone can enjoy what we have discovered so far. I will write up a more technical post on the results, here we’ll run through some of the highlights. For more details of anything, check out the data release. 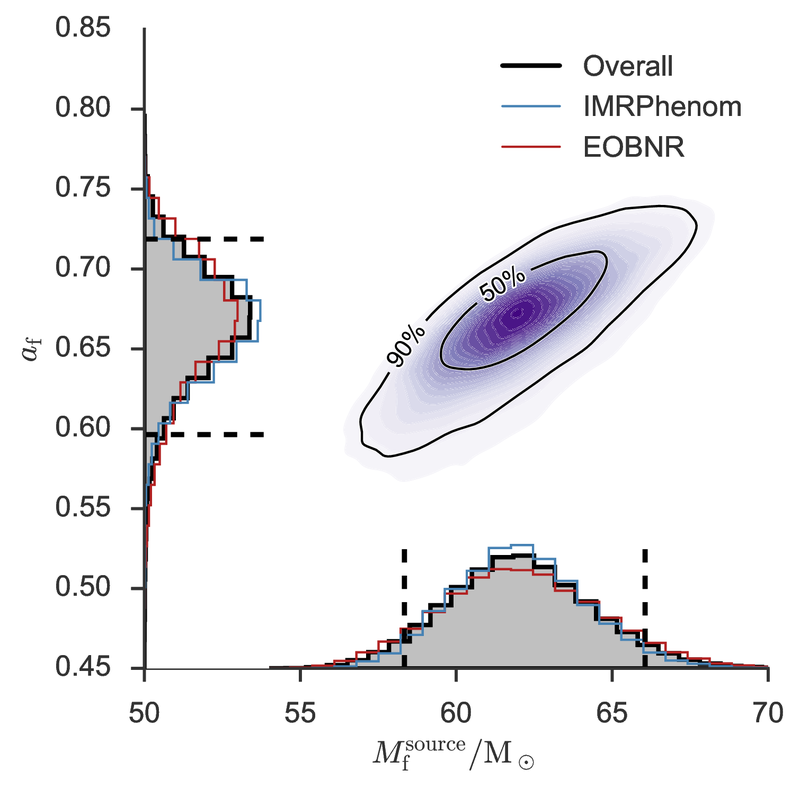 The results of our parameter-estimation runs tell us about the nature of the source. We have a binary with objects of masses and , where indicates the mass of our Sun (about kilograms). If you’re curious what’s going with these numbers and the pluses and minuses, check out this bonus note. Estimated masses for the two black holes in the binary. is the mass of the heavier black hole and is the mass of the lighter black hole. The dotted lines mark the edge of our 90% probability intervals. The different coloured curves show different models: they agree which made me incredibly happy! Fig. 1 from the Parameter Estimation Paper. We know that we’re dealing with compact objects (regular stars could never get close enough together to orbit fast enough to emit gravitational waves at the right frequency), and the only compact objects that can be as massive as these object are black holes. This means we’re discovered the first stellar-mass black hole binary! We’ve also never seen stellar-mass black holes (as opposed to the supermassive flavour that live in the centres of galaxies) this heavy, but don’t get too attached to that record. Black holes have at most three properties. This makes them much simpler than a Starbucks Coffee (they also stay black regardless of how much milk you add). Black holes are described by their mass, their spin (how much they rotate), and their electric charge. We don’t expect black holes out in the Universe to have much electric charge because (i) its very hard to separate lots of positive and negative charge in the first place, and (ii) even if you succeed at (i), it’s difficult to keep positive and negative charge apart. This is kind of like separating small children and sticky things that are likely to stain. Since the electric charge can be ignored, we just need mass and spin. We’ve measured masses, can we measure spins? Black hole spins are defined to be between 0 (no spin) and 1 (the maximum amount you can have). Our best estimates are that the bigger black hole has spin , and the small one has spin (these numbers have been rounded). These aren’t great measurements. For the smaller black hole, its spin is almost equally probable to take any allowed value; this isn’t quite the case, but we haven’t learnt much about its size. For the bigger black hole, we do slightly better, and it seems that the spin is on the smaller side. This is interesting, as measurements of spins for black holes in X-ray binaries tend to be on the higher side: perhaps there are different types of black holes? We can’t measure the spins precisely for a few reasons. The signal is short, so we don’t see lots of wibbling while the binaries are orbiting each other (the tell-tale sign of spin). Results for the orientation of the binary also suggest that we’re looking at it either face on or face off, which makes any wobbles in the orbit that are there less visible. However, there is one particular combination of the spins, which we call the effective spin, that we can measure. The effective spin controls how the black holes spiral together. It has a value of 1 if both black holes have max spin values, and are rotating the same way as the binary is orbiting. It has a value of −1 if the black holes have max spin values and are both rotating exactly the opposite way to the binary’s orbit. We find that the effective spin is small, . This could mean that both black holes have small spins, or that they have larger spins that aren’t aligned with the orbit (or each other). We have learnt something about the spins, it’s just not too easy to tease that apart to give values for each of the black holes. As the two black holes orbit each other, they (obviously, given what we’ve seen) emit gravitational waves. These carry away energy and angular momentum, so the orbit shrinks and the black holes inspiral together. Eventually they merge and settle down into a single bigger black hole. All this happens while we’re watching (we have great seats). A simulation of this happening is below. You can see that the frequency of the gravitational waves is twice that of the orbit, and the video freezes around the merger so you can see two become one. What are the properties of the final black hole? The mass of the remnant black holes is . It is the new record holder for the largest observed stellar-mass black hole! If you do some quick sums, you’ll notice that the final black hole is lighter than the sum of the two initial black holes. This is because of that energy that was carried away by the gravitational waves. Over the entire evolution of the system, of energy was radiated away as gravitational waves (where is the speed of light as in Einstein’s famous equation). This is a colossal amount of energy. You’d need to eat over eight billion times the mass of the Sun in butter to get the equivalent amount of calories. (Do not attempt the wafer-thin mint afterwards). The majority of that energy is radiated within the final second. For a brief moment, this one black hole merger outshines the whole visible Universe if you compare its gravitational-wave luminosity, to everything else’s visible-light luminosity! We’ve measured mass, what about spin? The final black hole’s spin in , which is in the middling-to-high range. You’ll notice that we can deduce this to a much higher precisely than the spins of the two initial black holes. This is because it is largely fixed by the orbital angular momentum of the binary, and so its value is set by orbital dynamics and gravitational physics. I think its incredibly satisfying that we we can such a clean measurement of the spin. We have measured both of the properties of the final black hole, and we have done this using spacetime itself. This is astounding! Estimated mass and spin for the final black hole. The dotted lines mark the edge of our 90% probability intervals. The different coloured curves show different models: they agree which still makes me incredibly happy! Fig. 3 from the Parameter Estimation Paper. How big is the final black hole? My colleague Nathan Johnson-McDaniel has done some calculations and finds that the total distance around the equator of the black hole’s event horizon is about (about six times the length of the M25). Since the black hole is spinning, its event horizon is not a perfect sphere, but it bulges out around the equator. The circumference going over the black hole’s poles is about (about five and a half M25s, so maybe this would be the better route for your morning commute). The total area of the event horizon is about . If you flattened this out, it would cover an area about the size of Montana. Neil Cornish (of Montana State University) said that he’s not sure which we know more accurately: the area of the event horizon or the area of Montana! OK, we’ve covered the properties of the black holes, perhaps it’s time for a celebratory biscuit and a sit down? But we’re not finished yet, where is the source? We infer that the source is at a luminosity distance of , a megaparsec is a unit of length (regardless of what Han Solo thinks) equal to about 3 million light-years. The luminosity distance isn’t quite the same as the distance you would record using a tape measure because it takes into account the effects of the expansion of the Universe. But it’s pretty close. Using our 90% probability range, the merger would have happened sometime between 700 million years and 1.6 billion years ago. This coincides with the Proterozoic Eon on Earth, the time when the first oxygen-dependent animals appeared. Gasp! With only the two LIGO detectors in operation, it is difficult to localise where on the sky source came from. To have a 90% chance of finding the source, you’d need to cover of the sky. For comparison, the full Moon is about . This is a large area to cover with a telescope, and we don’t expect there to be anything to see for a black hole merger, but that hasn’t stopped our intrepid partners from trying. For a lovely visualisation of where we think the source could be, marvel at the Gravoscope. Black holes 30 times the mass of our Sun do form These must be the remains of really massive stars. Stars lose mass throughout their lifetime through stellar winds. How much they lose depends on what they are made from. Astronomers have a simple periodic table: hydrogen, helium and metals. (Everything that is not hydrogen or helium is a metal regardless of what it actually is). More metals means more mass loss, so to end up with our black holes, we expect that they must have started out as stars with less than half the fraction of metals found in our Sun. This may mean the parent stars were some of the first stars to be born in the Universe. Binary black holes exist There are two ways to make a black hole binary. You can start with two stars in a binary (stars love company, so most have at least one companion), and have them live their entire lives together, leaving behind the two black holes. Alternatively, you could have somewhere where there are lots of stars and black holes, like a globular cluster, and the two black holes could wander close enough together to form the binary. People have suggested that either (or both) could happen. You might be able to tell the two apart using spin measurements. The spins of the black holes are more likely to be aligned (with each other and the way that the binary orbits) if they came from stars formed in a binary. The spins would be randomly orientated if two black holes came together to form a binary by chance. We can’t tell the two apart now, but perhaps when we have more observations! Black holes are the parts of the Universe with the strongest possible gravity. They are the ideal place to test Einstein’s theory of general relativity. The gravitational waves from a black hole merger let us probe right down to the event horizon, using ripples in spacetime itself. This makes gravitational waves a perfect way of testing our understanding of gravity. We have run some tests on the signal to see how well it matches our expectations. We find no reason to doubt that Einstein was right. The first check is that if we try to reconstruct the signal, without putting in information about what gravitational waves from a binary merger look like, we find something that agrees wonderfully with our predictions. We can reverse engineer what the gravitational waves from a black hole merger look like from the data! 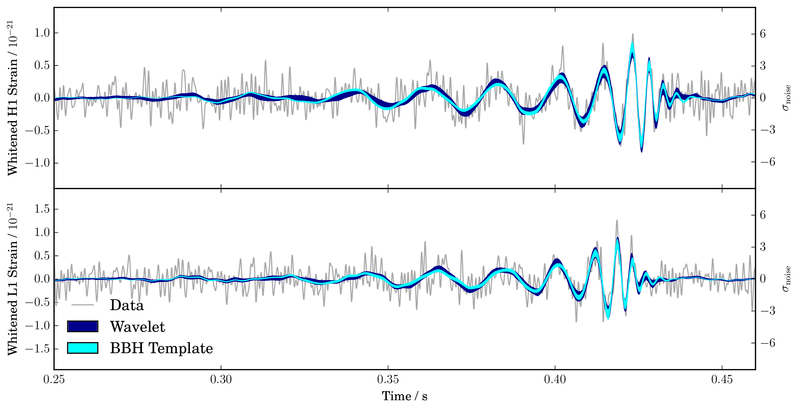 Recovered gravitational waveforms from our analysis of The Event. The dark band shows our estimate for the waveform without assuming a particular source (it is build from wavelets, which sound adorable to me). The light bands show results if we assume it is a binary black hole (BBH) as predicted by general relativity. They match really well! Fig. 6 from the Parameter Estimation Paper. As a consistency test, we checked what would happen if you split the signal in two, and analysed each half independently with our parameter-estimation codes. If there’s something weird, we would expect to get different results. We cut the data into a high frequency piece and a low frequency piece at roughly where we think the merger starts. The lower frequency (mostly) inspiral part is more similar to the physics we’ve tested before, while the higher frequency (mostly) merger and ringdown is new and hence more uncertain. Looking at estimates for the mass and spin of the final black hole, we find that the two pieces are consistent as expected. In general relativity, gravitational waves travel at the speed of light. (The speed of light is misnamed, it’s really a property of spacetime, rather than of light). If gravitons, the theoretical particle that carries the gravitational force, have a mass, then gravitational waves can’t travel at the speed of light, but would travel slightly slower. Because our signals match general relativity so well, we can put a limit on the maximum allowed mass. The mass of the graviton is less than (in units that the particle physicists like). This is tiny! It is about as many times lighter than an electron as an electron is lighter than a teaspoon of water (well, , which is just under a full teaspoon), or as many times lighter than the almost teaspoon of water is than three Earths. 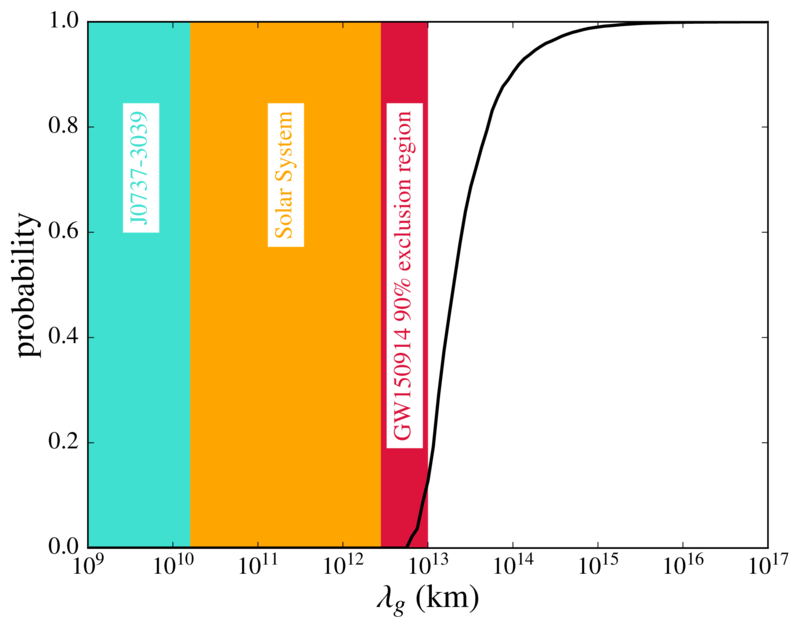 Bounds on the Compton wavelength of the graviton from The Event (GW150914). The Compton wavelength is a length defined by the mass of a particle: smaller masses mean large wavelengths. We place much better limits than existing tests from the Solar System or the double pulsar. There are some cosmological tests which are stronger still (but they make assumptions about dark matter). Fig. 8 from the Testing General Relativity Paper. Overall things look good for general relativity, it has passed a tough new test. However, it will be extremely exciting to get more observations. Then we can combine all our results to get the best insights into gravity ever. Perhaps we’ll find a hint of something new, or perhaps we’ll discover that general relativity is perfect? We’ll have to wait and see. 100 years after Einstein predicted gravitational waves and Schwarzschild found the equations describing a black hole, LIGO has detected gravitational waves from two black holes orbiting each other. This is the culmination of over forty years of effort. The black holes inspiral together and merge to form a bigger black hole. This is the signal I would have wished for. From the signal we can infer the properties of the source (some better than others), which makes me exceedingly happy. We’re starting to learn about the properties of black holes, and to test Einstein’s theory. As we continue to look for gravitational waves (with Advanced Virgo hopefully joining next year), we’ll learn more and perhaps make other detections too. The era of gravitational-wave astronomy has begun! There’s also this video from my the heads of my group in Birmingham on their reactions to the discovery (the credits at the end show how large an effort the detection is). At the Large Hadron Collider, there are separate experiments that independently analyse data, and this is an excellent cross-check of any big discoveries (like the Higgs). We’re not in a position to do this for gravitational waves. However, the different search pipelines are mostly independent of each other. They use different criteria to rank potential candidates, and the burst and binary searches even look for different types of signals. Therefore, the different searches act as a check of each other. The teams can get competitive at times, so they do check each other’s results thoroughly. Updating Have we detected gravitational waves yet? was doubly exciting as I had to successfully connect to the University’s wi-fi. I managed this with about a minute to spare. Then I hovered with my finger on the button until David Reitze said “We. Have detected. Gravitational waves!” The exact moment is captured in the video below, I’m just off to the left. We don’t get a single definite number from our analysis, we have some uncertainty too. Therefore, our results are usually written as the median value (which means we think that the true value is equally probable to be above or below this number), plus the range needed to safely enclose 90% of the probability (so there’s a 10% chance the true value is outside this range. For the mass of the bigger black hole, the median estimate is , we think there’s a 5% chance that the mass is below , and a 5% chance it’s above , so we write our result as . Gravitational-wave detectors measure the amplitude of the wave (the amount of stretch and squash). The measured amplitude is smaller for sources that are further away: if you double the luminosity distance of a source, you halve its amplitude. Therefore, if you improve your detectors’ sensitivity by a factor of two, you can see things twice as far away. This means that we observe a volume of space (2 × 2 × 2) = 8 times as big. (This isn’t exactly the case because of pesky factors from the expansion of the Universe, but is approximately right). Even a small improvement in sensitivity can have a considerable impact on the number of signals detected! Congratulations on this sensational news and on your contribution to this wonderful discovery. To me it’s the biggest thing to happen in physics since my days as a student in Birmingham’s Physics Department in the 1960s. Congratulations too from the Carolian Astronomy Society in Kidderminster. Thank you for your post on “The Event”, explaining the LIGO detection of gravitational waves. I’m a recently retired physicist with an amateur interest in cosmology, so I appreciate the technical details you’ve given that are not easy to find elsewhere. I do have a question I hope you can answer: Why is there no mention of a search for a coincident gamma ray burst for the GW150914 event? I understand this is expected for a merger of neutron stars or of a neutron star with a black hole (http://www.ligo.org/science/Publication-S6GRB/); so are GRBs not also expected from a merger of two black holes? It would be marvellous if coincident GRBs were found as this would provide completely independent verification of the astrophysical origin of the LIGO signal. Are such searches planned for in the future? Thanks for the excellent read, certainly exciting times 100 years on from conjecture. I told in excitement our 9 year old yesterday morning, she didn’t skip a beat “I KNEW they were there”. We could use your daughter in LIGO. How does she feel about becoming a physicist? Thanks for the typo spotting—I’m having an early night tonight! Get some great well deserved rest tonight! I’m not an experimentalist myself, so I’m sure she’ll be fine. I thought I fixed that one earlier, I must have forgotten to save! I did a phd working on/with GR, and stringy extensions thereof, and i have to say this is the most exciting news in physics i ever watched!!!! And thanks for this very good review post! What a signal! That’s incredible.. In a community, where we’re used to get 95%CL exclusion results or signal to noise ratio of 1/10000000, you guys just get a clean nice signal of two black-holes merging (!) propagating with GWs! Confirming two of the main results of GR in a single shot! And that when GR just turn 100! This is almost too beautiful… Oh yea, and meanwhile opening a new era for astronomy.. Good job! From the precision of the signal I guess this will radically change evolution of physics and astronomy. Thank you! All we need now is for LISA Pathfinder to work perfectly too. And it is looking great so far! I’d love to hear your compositions. They might be quite popular with my colleagues. Yea, LISA… As a theoretical physicist, i’m always completely amazed of which impressive engineering answers experimentalists come to when pursuing a measurement! Good luck to LISA pathfinder then! Thank you for this post. I’ve been trying to explain to friends and family the sheer excitement of this discovery. Your account really gets it across. And it also teaches a little about the data analysis (and sanity-checking) process, and what you can and can’t say about the black hole parameters. It must have been so weird to find *exactly* what you had been looking for. I think you mentioned elsewhere that, once the model is subtracted from the data, the residuals are beautifully Gaussian. I bet you pinched yourself a few times! Thanks Sam! I’m glad that you enjoyed the post! Finding the signal was fantastic. Although it wasn’t exactly what we were looking for because we had expected binary neutron stars to be the most likely signal. On September 14 I was busy checking how our parameter estimation would work on quiet binary neutron star signals—we didn’t anticipate a loud binary black hole! With regards to the black hole mass, I just meant that if you wait a fraction of second, the record will be taken by the final black hole. We do still have to finish analysing the rest of O1 data. We’ve been rather preoccupied up to now. Now I understand what you meant (“If you wait a fraction of second, the record will be taken by the final black hole.”). I wonder, do we know/can we tell whether the progenitors (29 + 36 solar mass BHs) had been formed from previous BH mergers, or whether they were formed at that roughly that mass in supernovae? I hope GW astronomy will help us to understand how supermassive BHs came to be — were they formed by an accumulation of mergers, starting from the first stellar-mass BHs in early stars? It may be that LIGO shows that our current terminology (stellar-mass / intermediate-mass / supermassive) could be refined. It seems unlikely that both black holes would be the results of mergers, just because of the coincidences necessary for this to happen. Furthermore, if they were the products of mergers, we’d expect their spins to be about 0.7 (as for the final black hole here). This isn’t ruled out by our measurements, but we do prefer smaller values. We think they are the remains of high mass, low metallicity stars. A few more detections will give us better insights into the population. Perhaps if these type of mergers happen in clusters, we could go on to build intermediate mass black holes, which maybe could grow into supermassive black holes. For now, what we know is that black holes of sixty solar masses exist. Thanks, very helpful. I guess that you are already constraining the event rates for these kind of mergers out to z=0.1ish. At this point, I suppose we don’t know much about the immediate astrophysical environment of this system. But if there really is a GRB counterpart (speculating! ), then perhaps this merger occurred inside a cluster with other stars, gas and BHs. Do we know anything about whether the final black hole experienced a significant “kick”? We don’t know much about a kick. It would leave a tiny imprint on the ringdown ,so we really need to figure it out based on spin measurements. Of course, these are uncertain. Since we favour small spins, the kick is probably small too. I’ll write more about all these later. Thanks for your patience with my naive questions 😉 I’ll read the companion papers, and look out for your next blog post. I’m happy to answer! I keep expecting people to get bored and want to change the subject. Haha, I ignored the first few emails too. Then I decided, “it will probably turn out to be nothing.” Later I decided, “it will probably turn out to be an injection somehow.” It was ages before I decided, “actually this could really be something” and then I had to go an have a little lie down for a while. I remember having to reread the emails because I wasn’t sure if I was hallucinating. I must say thanks for for posting this incredible stuff! If the GW is the Ripple of Space Time Curvature that propagates in space and time. Isn’t it equivalent with saying space-time propagates in space-time? Can space move? what is the reference? This is a really good question. We use the phrase “ripple in spacetime” as it helps people to try to visualise what is going on (and because it sounds cool), but it does hide a lot of technicalities. I’ll try to give a little more details here, but I think a proper explanation would require a post of its own. Electromagnetic waves (like light or radio) might be more familiar than gravitational waves. Electromagnetic waves are oscillations (wibbles) of the electric and magnetic fields. The electric and magnetic fields are really two aspects of the same thing, so we can package these together and then an electromagnetic wave is a ripple in this. Gravitational waves are similar in many ways to electromagnetic waves (the maths is similar, but not quite the same). As you might expect, instead of having an oscillation of the electromagnetic field, we have an oscillation in the gravitational field—but general relativity tells us that gravity is just the effect of the warping of spacetime. The curvature of spacetime is encoded in the metric, which takes the role of the gravitational field in general relativity (if you consider weak gravity, you see that part of the metric takes the form of Newton’s gravitational potential). The metric tells you the distance between different points in spacetime, and it is this which oscillates. This is why a gravitational wave is a stretch and squash. So, a gravitational wave is an oscillation in the spacetime metric tensor. That’s not quite as catchy as saying it is a ripple in spacetime, but perhaps that gives some insight. We have the metric which encodes how spacetime is curved at any given point, and this is what oscillates. You might be wondering if gravitational waves change the metric, and the metric tells you about the curvature of spacetime (and hence how waves should move), do you get some form of messy interaction? The answer is yes. This is why we need simulations on supercomputers to figure out what happens when two black holes merge. Fortunately, things get much simpler when you consider the small gravitational waves that we detect here on Earth, and you can neglect these extra effects. To find out more you’ll need to delve into the details of general relativity. Most introductory textbooks on general relativity have a section on gravitational waves towards the end. I am a research professor at Northwestern University. I study what we can learn about astrophysical objects like black holes from their gravity, and what we can learn about gravity from astronomical observations. I blog about topics relevant to my research and teaching. Posts cover a variety of levels: try browsing by category to find something of interest to you. This work by Christopher Berry is licensed under a Creative Commons Attribution-NonCommercial-ShareAlike 4.0 International License.